“The strategy of economic policy was reformulated in the sixties. 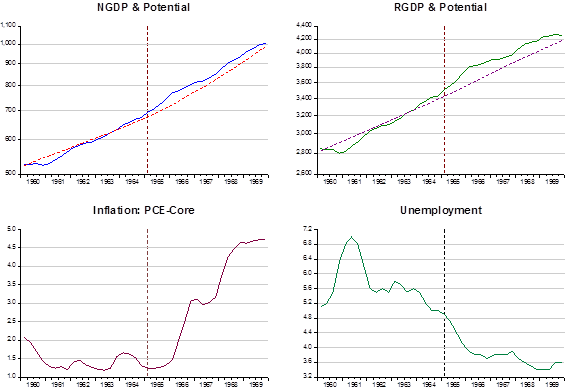 The revised strategy emphasized, as standard for judging economic performance, whether the economy was living up to its potential rather than merely whether it was advancing…the focus on the gap between potential and actual output provided a new scale for the evaluation of economic performance, replacing the dichotomized business cycle standard which viewed expansion as satisfactory and recession as unsatisfactory. This new scale of evaluation, in turn, led to greater activism in economic policy: As long as the economy was not realizing its potential, improvement was needed and government had a responsibility to promote it. Finally, the promotion of expansion along the path of potential was viewed as the best defense against recession. Two recessions emerged in the 1957-60 period because expansions had not had enough vigor to be self-sustaining. The slow advance failed to make full use of existing capital; hence, incentives to invest deteriorated and the economy turned down. In light of the conclusion that anemic recoveries are likely to die young, the emphasis was shifted from curative to preventive measures. The objective was to promote brisk advance in order to make prosperity durable and self-sustaining…The adoption of these principles led to a more active stabilization policy. The activist strategy was the key that unlocked the door to sustained expansion in the 1960s”. “The record of economic performance shows serious blemishes, particularly the inflation since 1966. To some degree, these reflect errors of analysis and prediction by economists; to a larger degree, however, they reflect errors of omission in failing to implement the activist strategy”. Funny how often policymakers and commenters fall prey to the “it wasn´t enough” argument, in this case not “activist enough” or, more recently, “the 2009 fiscal stimulus wasn´t big enough”. “Keynes’ reasoning points obviously to the superiority of inflationary remedies for unemployment over money-wage reductions. In a world organized in accordance with Keynes’ specifications there would be a constant race between the printing press and the business agents of the trade unions, with the problem of unemployment largely solved if the printing press could maintain a constant lead and if only volume of employment, irrespective of quality, is considered important”. “The stimulus to the economy also reflected a unique partnership between fiscal and monetary policy. Basically, monetary policy was accommodative while fiscal policy was the active partner. The Federal Reserve allowed the demands for liquidity and credit generated by a rapidly expanding economy to be met at stable interest rates”. “The Great Depression had taught everyone the lesson that business cycles were shortfalls below and not fluctuations around, sustainable levels of production and employment”. This exactly matches Okun´s view of the “gap that needs to be filled”. More likely, both views are correct in that according to the policymakers at the CEA, “we´ll use every trick that will help us get there”! The “employment obsession” of the 1960s policymakers ended up putting excessive pressure on the economic fabric. A steady rise in inflation was the outcome. The panel below shows how things progressed. It appears that potential output calculations by the economists at the CEA were far too optimistic relative to potential output calculations made by the Congressional Budget Office (CBO) available today. In fact, by 1965, the year after the tax cut was enacted, the economy was beginning to “overheat”. Both nominal spending and real output began to grow above potential levels. This is confirmed by what happened to inflation and unemployment, where the continuing fall in unemployment is indicative that the rise in inflation was not expected. The CEA optimism is clearly demonstrated in this chart comparing actual and potential output calculated by the CEA in the 1969 Economic Report of the President (ERP) and the equivalent calculation by the CBO. As the next chart shows, in the 1960s the Phillips Curve was “well behaved” in the sense of providing a “stable” relationship between unemployment and inflation. As Friedman (1968) argued, that “stability” should be illusory because as soon as workers began to expect inflation the curve would shift and “low” unemployment would only be maintained with rising inflation. As can be observed this is exactly what happened going into the 1970s. What went wrong in the 1960s? There´s nothing wrong with the concept of potential real output, the guiding principle of policymakers in the sixties. The big problem is that it´s hard to estimate, especially in real time so that the chance that economic policy gets it wrong is high with the consequence that instead of higher real output the economy gets stranded with higher inflation. Market Monetarist principles, on the other hand, do not emphasize the control of real quantities like unemployment or real output, but propose that monetary policy be geared to stabilize nominal spending – the dollar value of total spending – in the economy along a target level path. The chart below gives an illustrative example. We calculate the nominal spending trend from 1954 to 1964 and observe what nominal spending would be if it had progressed along the trend path. Since nominal spending deviated systematically from that trend after 1965, the result was increasing inflation. At other times, indicated by circles, inflation is up or down depending on if spending is above or below trend. How did the economy end up triggering inflation? The policymakers at the CEA were very well meaning and really thought they had learned to “conquer the business cycle”, keeping the economy at all times at or very close to its potential. To them the answer lay in the appropriate management of fiscal policy with monetary policy playing second fiddle and helping by keeping interest rates “low”. The “new economics” sought to liberate federal fiscal policy from restrictive guidelines unrelated to the performance of the economy. The Council sought to liberate monetary policy to focus it squarely on the same macroeconomic objectives that should guide fiscal policy. That´s just another way of saying that the “policy mix” should contemplate expansionary fiscal (tax cuts) sanctioned by a monetary policy that kept the interest rate “low”. Finally, post mortem, Kennedy´s tax cut was sanctioned. 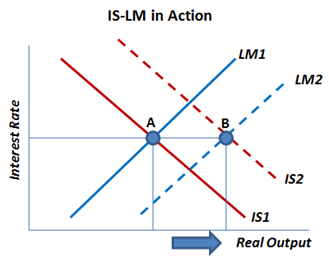 The IS-LM chart shows the rationale for Tobin´s “principles”. The tax cut would have maximal effect if monetary policy helped keep the interest rate “constant” so as not to discourage investment. “…So far as I know, there has been no empirical demonstration that the tax cut had any effect on the total flow of income in the US. There has been no demonstration that if monetary policy had been maintained unchanged…the tax cut would have been really expansionary on nominal income…”. 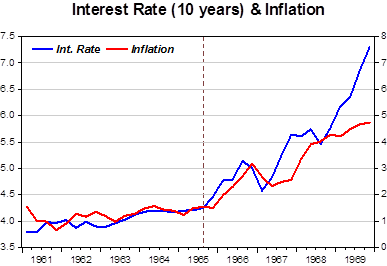 The next chart shows that when nominal spending “took off”, interest rates and inflation followed suit. “In 1965 the nation was entering essentially uncharted territory. The economists in government were ready to meet the welcome problems of prosperity. But they recognized that they could not provide a good encore to their success in achieving high-level employment”. “…The plain fact is that economists simply don´t know as much as we would like to know about the terms of trade between price increases and employment gains (i.e, the shape and stability of the Phillips Curve). We would all like the economy to tread the narrow path of balanced, parallel growth of demand and capacity utilization as is consistent with reasonable price stability, and without creating imbalances that could make continuing advance unsustainable. But the macroeconomics of a high employment economy is insufficiently known to allow us to map that path with a high degree of reliability…It is easy to prescribe expansionary policies in a period of slack. Managing high-level prosperity is a vastly more difficult business and requires vastly superior knowledge. The prestige that our profession has built up in the Government and around the country in recent years could suffer if economists give incorrect policy advice based on inadequate knowledge. We need to improve that knowledge”. It seems, given what went on over the past four or five years that we still very much need to improve our knowledge. But despite the doubts, the Government economists still kept faith on the power of fiscal policy to stabilize the economy near its potential. The financing needs of the Vietnam War which escalated at that time certainly made policymaking harder and confusing. The next chart summarizes the history going into the 1970s. Desperate to keep employment at a high level, monetary policy was consistently expansionary, parting a rising trend to nominal spending, which was translated into rising inflation. As we´ll show in another post, the 70s inflation reflected the complete failure of monetary policymakers to realize that inflation was a monetary phenomenon, while at the same time maintaining the employment obsession of the previous decade. A drastic revision of monetary policy had to wait until the early 1980s and following that change, how, unwittingly, a monetary experiment that could be construed as “stabilizing nominal spending along a level path” was practiced. Great! The explanation of the theoretical foundations of the “New Economics” is particularly useful. Great post Marcus. I think inflationary build-ups are easier to understand than (big) disinflations such as the engineered by Volcker, or say the Real plan. How come people suddenly realize their expectations were too high? Thank you, Marcus, for a good post. The history of that era is important, I think. In fact, by 1965, the year after the tax cut was enacted, the economy was beginning to “overheat”. Both nominal spending and real output began to grow above potential levels. This is confirmed by what happened to inflation and unemployment, where the continuing fall in unemployment is indicative that the rise in inflation was not expected. I think “confirmed” is the wrong word. If I understand correctly, potential output is estimated by working backward from the results — from inflation and unemployment, essentially. So then, “what happened to inflation and unemployment” is simply a re-wording of the PGDP estimate, not a confirmation of it. NA, not quite. The excessive rise in spending reduced unemployment but inflation initially remained dormant, so the increase in RGDP was strong. 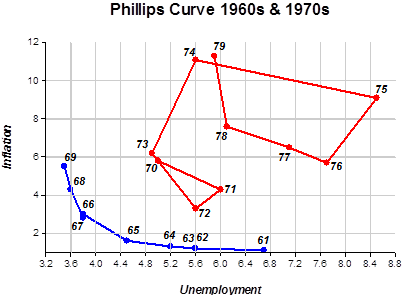 There was, at the time, a belief in the existence of a Phillips Curve. Soon, though, inflation expectations adjusted, just as Friedman said they would. Unemployment and inflation went up and real growth down.